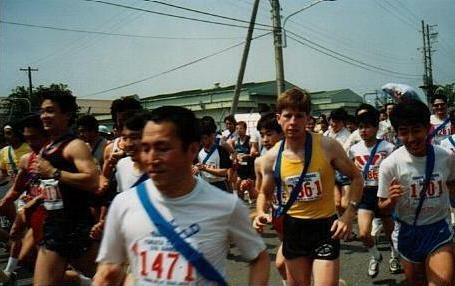 The annual Yokota Airbase 5x5K relay. We had 1045 runners show up for this little thingy. 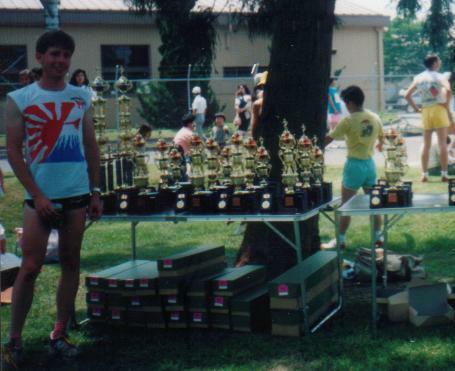 The base runners club, the Yokota Striders, of which I was an active member, had their own "elite" relay team. However, they didn't pick it based on talent. Neither Art Robledo nor I were asked to run in it, even though we were both far faster than three of the five runners on the elite team. I asked Art about it and he was upset...said it was the "Good old boy system”. So here I was, having won three of the four runs I'd done, including a 5K run the day before, and the bicycle race, and not being considered the top five of the club...without a team. I felt slighted and also that it was unfair to everyone on the club to have a less-than-best "elite team". I was friends with a 60 year-old runner named Dave Thomas (no relation to the Wendy's founder) who was very good for his age. He'd run a 5K in under 20 minutes, and then have a smoke. He was a club member and needed another guy for the "over 40" team. Based on the rules, the average age of the team had to be over 40. With Dave being 60 it was possible for a 23 year-old (ME) to join the team and be within the rules. 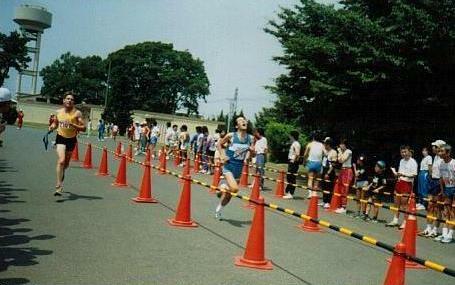 One of the runners of the elite team got injured and Art managed run with them. I look funny in these photos...I had a biker's tan so I looked a bit gay, and my arm swing was always messed up. As the anchor on the team, I ran a personal best of 16m40s, and after fighting the mob of runners, our team WON the "over 40" team competition. The elite team didn't even place. I guess there is a God.